Many of us have heard about how industrialization has dramatically increased the levels of CO2 in the atmosphere. The effect is certainly taking a toll on our environment and the overall health of our planet. Even if 500ppm seems like a relatively large number, it pales in comparison with the indoor air quality. In rooms with 3 or more people without proper air circulation this number can triple within minutes. That might sound scary, but what is the actual effect of working in elevated CO2 environments? This is exactly what 6 researchers from Harvard set out to answer in 2015, and their findings shocked the public health community. They took 22 healthy volunteers over a period of a week and exposed them to varying levels of CO2 and cognitive assessment was performed daily using the Strategic Management Simulation (SMS) software tool, which is a computer-based test that has been designed to test the effectiveness of management-level employees through assessments of higher-order decision making. They tested the subjects on 9 different activity domains, the results are reflected in the figure below. Shockingly! Findings report that an increase to 945 ppm our cognitive abilities decrease by 15%. However, when the CO2 concentration reaches up to 1400 ppm, the average cognitive score drops to 50%! Now, as in most companies the largest part of running costs are constituted by employees, and if you are paying your employees for their knowledge-based work that depends on their cognitive abilities, how much does CO2 buildup in the office cost you? This is exactly what we set out to measure. By installing a CO2 monitoring system in our offices, we monitored the environment in one of our meeting rooms. The data is shown below. Knowing that on average during a meeting there are 4 people in the room and multiplying their average cost to company (in minutes) with the time spent in high CO2 environments, we realized that a single meeting room was responsible for approximately 2000 EUR loss in employee cognitive abilities over a period of 2 months! A simple, easy to use monitoring system, that alerts you when the CO2 levels are exceeding norms. The next two months of increased ventilation and regular opening of the windows when CO2 was too high, fixed the problem – data are shown below. 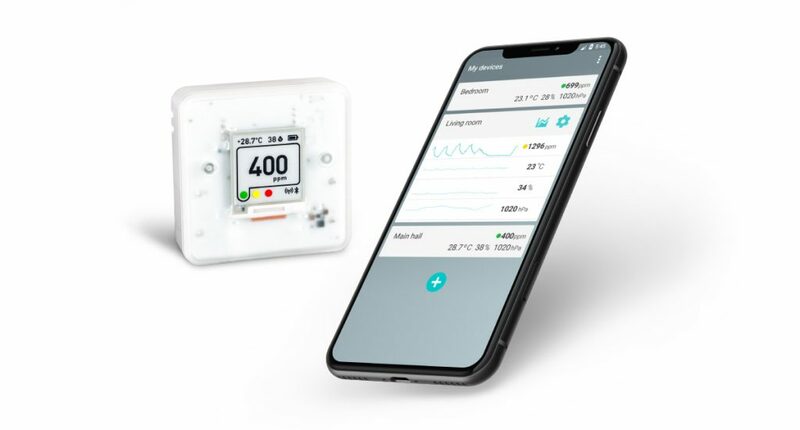 Aranet4 is a wireless 4 in 1 sensor that monitors indoor air quality at home, school or office! Aranet 4 is a battery–powered standalone solution that measures CO2, temperature, relative humidity and atmospheric pressure. Values of CO2, temperature and relative humidity are displayed on the screen and the colors on the display indicate when the CO2 limits have exceed recommended norms. Aranet4 also has a handy app that allows Bluetooth connectivity to a smartphone to view historical data up to one week. For large scale application, where several rooms need to be monitored, up to 100 Aranet4 devices can be connected to the Aranet PRO base station. Aranet PRO offers centralized data gathering and viewing of real time data, as well as unlimited historical information and alert functionality. Contact us info@aranet.com to receive more information! This doesn't have to be the end, let's stay in touch!